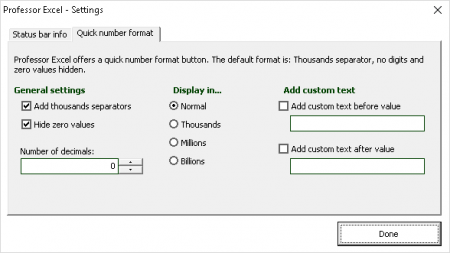 How to use custom number formats? 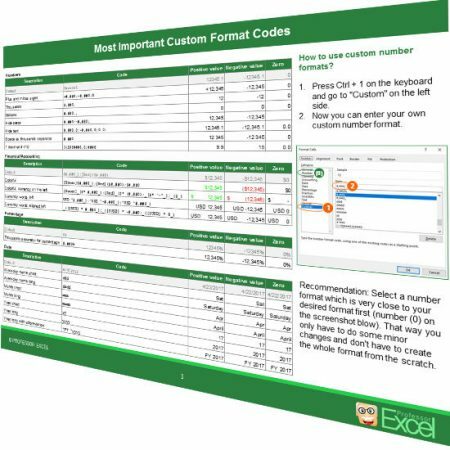 How do custom formats work? Insert a custom number format by pressing Ctrl + 1 on the keyboard and type the code in the text field of the “Custom” category. Press Ctrl + 1 on the keyboard and go to “Custom” on the left-hand side. Now you can enter your own custom number format code. Recommendation: Select a number format which is very close to your desired format first (number (0) on the screenshot). That way you only have to do some minor changes and don’t have to create the whole format from the scratch. Each part is divided by the ; (semicolon). A number format must at least have one part. All other parts can be omitted. If omitted, the first part counts for the later numbers. For example: You just define the positive number format. This formatting will be used for negative values, zeros and text (as far as possible). In practice, the fourth part is hardly used. The first part is used for defining positive numbers. Also, if the following parts aren’t used, this format is used for negative number, zeros and text too. Second part: If you want, you can define a different number format for negative number. Do you want to have a special format for zeros? You can set it in the third section of the format code. The fourth part is used for text. If there is no fourth part (and therefore no third semicolon) text will be shown normally. But if you use the fourth part, use the @ sign for showing it. If you don’t insert the add sign, text won’t be displayed.
? If you want to align the decimal points, use the question mark. Question marks can also be used for fractions. ???.??? @ The @ sign is only used in the fourth section of the format code. 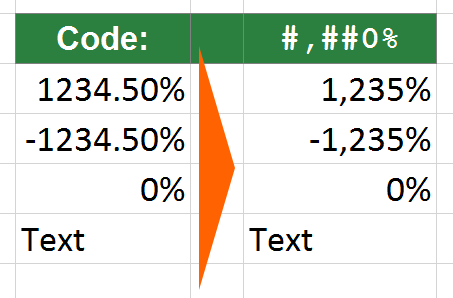 Use it, if you want to display text in a cell. If you don’t use it (but still have 3 semicolons and therefore 4 sections), text will be hidden. @”!” Some text Some text! 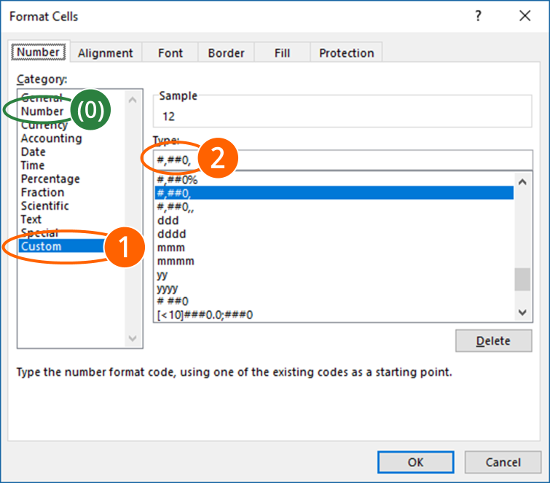 First step: Create a number format with the “Format Cells” window. 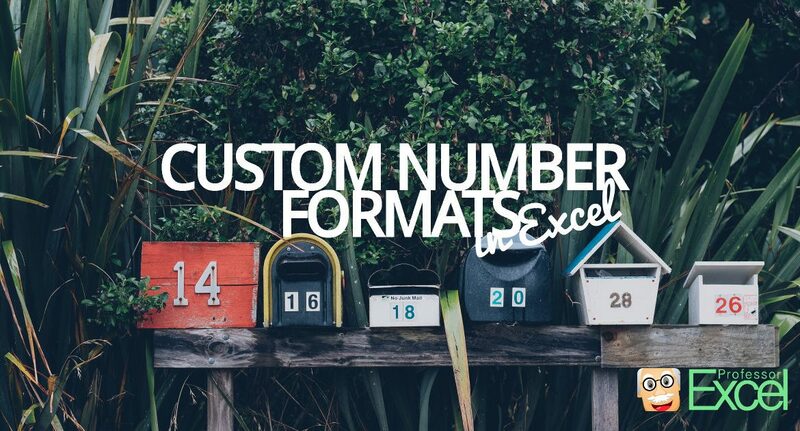 As the first step, choose a built-in number format which is very close to the one you eventually want to create. 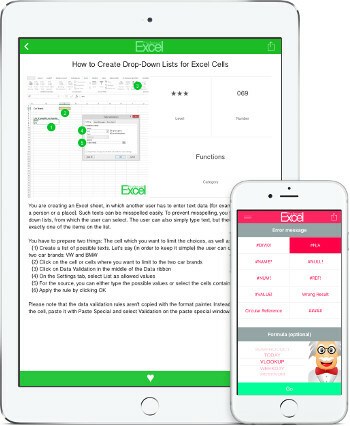 Open the “Format Cells” window by pressing Ctrl + 1 on the keyboard. 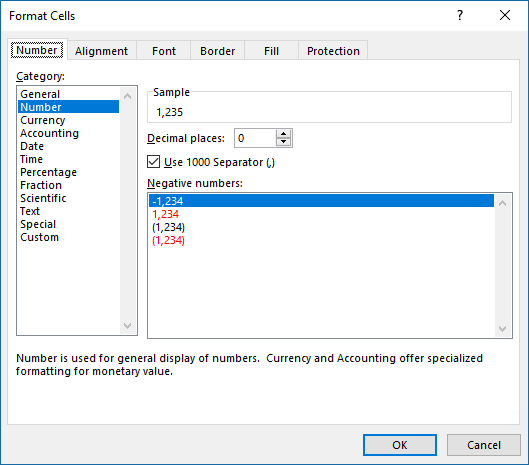 Check the tick of the thousands separator and change the decimal numbers to 2. If you open the “Format Cells” window again and click on “Custom” on the left-hand side, you’ll see the format code. In this example it should be #,##0.00 . 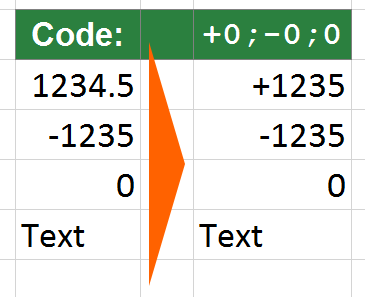 In this example, you want to further modify the number format for negative values, zeros and text. You continue with the code #,##0.00 created in step 1 above. If there is just one section, the format code is used for all kinds of values: For positive values, negative values, zeros and text because there is no particular definition for negative numbers, zeros and text. For negative values, you want to use the minus sign and use red color. Copy the format code to create a second section. Now you got the format code #,##0.00;#,##0.00 . Add the minus sign to the second part. #,##0.00;-#,##0.00 . Add the code for red color for negative values: #,##0.00;[Red]-#,##0.00 . Zeros should just have one digit. For a text value, you want to show nothing. Add a forth part to your code and leave it blank. That way, no value will be shown for text. You custom format code now is #,##0.00;[Red]-#,##0.00;0; . In the last step, you can further fine-tune the number of decimals. Therefore, use the buttons “Increase Decimal” or “Decrease Decimal” in the center of the “Home” ribbon. You don’t want to create your own code but just copy & paste one of the most popular custom number formats? Here are the most frequently asked codes. In many Excel tables, you can see divisions by 1000 or multiplications by 1000 in order to convert values to thousands or millions. An easier and more reliable way is to always use total values and just display them as thousands or millions. The easiest way: Add a comma “.” to your code. If you got this code #,##0 just add a comma “,” and you got #,##0, . That way, 2,345 becomes 2. For more information about thousands and millions, please refer to this article. +#,##0;-#,##0;0 for the following format: +1,234 for positive values, -1,234 and 0 for zeroes. 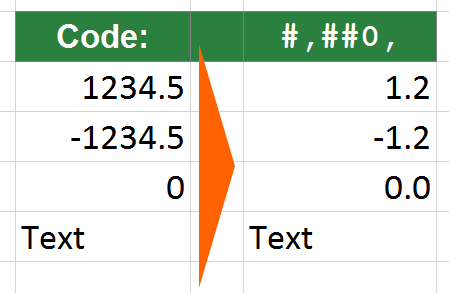 There are several ways to hide zeroes in Excel. Please refer to this article for more information about the other methods. 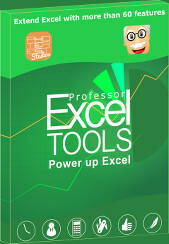 Some formatting can also be done by conditional formatting rules. 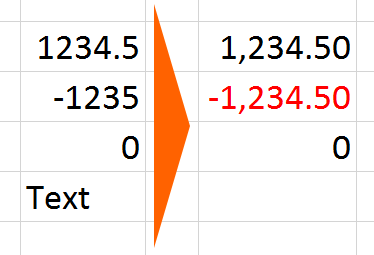 If your custom number format becomes too complex, please switch to conditional formatting rules. They are usually easier to use and provide more options. Use copy and paste as often as possible. Either for the formatting itself, or for the custom number code. That way, you can save a lot of time. Do you want to change the thousand separator, for example use a full stop instead of a comma? You could achieve this either in the “Region” settings of Windows or override the thousands and decimal separator in Excel. Please refer to this article for more information. A handy printout with the most common custom format codes. It’s a one-page PDF file. Download it here. The same codes as an Excel table. Maybe it’s easier for you to copy & paste the formats. Download it here. Was the information in this article helpful? 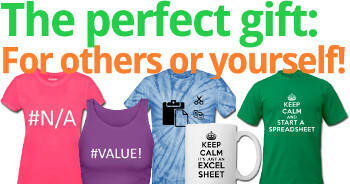 Why don’t you sign up for our free, monthly Excel newsletter? 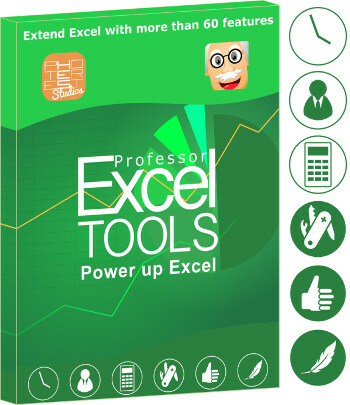 With our Excel add-in “Professor Excel Tools”, you can create your favorite number format. Even better, you can apply it with just one click. Why don’t you give it a try?